The tripod and bracket combine for the perfect sCharger mounting solution for portable, hands free solar charging. "Customers have been asking nonstop about future accessories" said Dean Sala, Founder and CEO of Suntactics. "With the addition of the new and improved website, we are finally able to offer our sCharger holder from our own online shopping cart." The new sCharger-5 holder consists of a simple, lightweight bracket, specially designed for the sCharger and also comes with a grip tripod which allows the user to mount the solar charger anywhere. Suntactics is known for their reliable and hassle free portable sChargers and this new mounting system is no exception. The bracket consists of a simple, sleek construction, which can easily attach to any standard 1/4-20 tripod. The sCharger holder comes with a durable grip tripod that is able to wrap around tree branches, tents, arm rests, RV/boat rails or even a backpack. 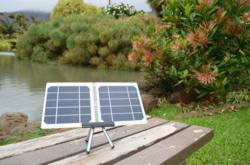 The tripod and bracket combine for the perfect sCharger holder solution for portable, hands free solar charging. The ingenious design allows for the sCharger to conveniently slip into the bracket, with no moving parts or mounting points to break. Add a larger tripod into the mix and you have a great holder for your sCharger-12 too. Suntactics focuses on portable solar and off grid solar energy products. Their current products are a unique 5-watt handheld solar charger called the sCharger-5 for solar charging smartphones like the iPhone and the powerful dual port 14-watt solar charger called the sCharger-12 for solar charging multiple remote devices including tablets like the iPad. These compact, high power and durable solar power chargers meet the needs for a wide range of portable devices. The units are manufactured in the USA at Fastrak, a veteran owned contract manufacturer. Suntactics is headquartered in San Jose, CA.